On November 19, 1948, the aircraft carrier U.S.S. Leyte, (CV-32), was operating in the Atlantic Ocean off the coast of New England. 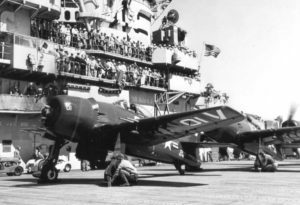 At about 12:30 p.m., Lieutenant Henry G. Goodloe was returning to the Leyte after a two-and-a-half hour training flight in an F8F Bearcat, (Bu. No. 121632). As Lt. Goodloe was making his landing approach he was given a “foul deck” wave-off. Goodloe increased throttle as he passed amidships and suddenly the Bearcat’s engine began to misfire, and smoke could be seen trailing from the aircraft as it began to climb away. The pilot declared an emergency, dropped the plane’s belly tank, and began getting into position for another landing approach. As he approached the rear of the ship, he radioed that he was going to have to ditch in the water, and after raising the landing gear, made a flat landing in the sea, but the aircraft reportedly sank within twenty seconds. Helicopters and destroyers immediately converged on the area but there was no sign of Lt. Goodloe or his aircraft. Lt. Goodloe was assigned to Fighting Squadron 71, (VF-71), based at Quonset Point, Rhode Island. In 1955 the aircraft carrier U.S.S. Leyte was stationed at the Quonset Point Naval Air Station in Rhode Island. In early December of that year, she put to sea for a three day cruise off New England to participate in anti-submarine training maneuvers. Navy pilot, Lieutenant (J.g.) Alfred G. Walker, 23, of Akron, Ohio, volunteered to go. On December 7, Lieutenant Walker, piloting an AD Skyraider, participated in a gunnery training flight over the water. As he was returning to the Leyte, the arresting cable snapped when it caught the Skyraider’s tail hook. The aircraft careened into the carrier’s superstructure and then cartwheeled into the sea. The Skyraider quickly sank to the bottom taking Lt. Walker with it, but his back-seat crewman, Aviation Ordinance Man 2nd Class William E. Deering of Atlantic City, New Jersey, managed to escape. 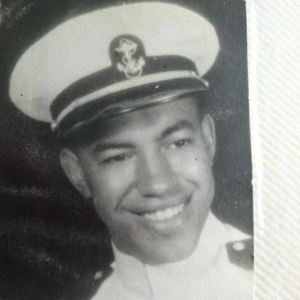 One of those who witnessed the accident was Boatswain’s Mate 2nd Class David Cata of the Bronx, New York, who was stationed aboard the nearby destroyer, U.S.S. Wadleigh. Upon seeing Deering bobbing helplessly in the water, Cata jumped overboard and swam to his aid and held Deering afloat until they were plucked form the water by a helicopter. Both men survived their ordeal. Lieutenant (J.g.) Walker was commissioned an Ensign in the U.S. Naval Reserve on December 3, 1953. His body was never recovered. Some sources describing this event state that it took place in Narragansett Bay, Rhode Island, however, the Ohio Informer, a newspaper from Akron, Ohio, where Lt. Walker was from, gave the location as 90 miles out to sea off the coast of New Jersey.